Officials from the Hamblen County School System, Walters State Community College and the Tennessee Board of Regents gathered at the college’s Morristown campus to celebrate a major milestone – the one-year anniversary of the mobilization partnership, creating a pathway to learning on mobile devices like iPads and smart phones from pre-kindergarten through college. “This partnership has drawn international attention and has exceeded everyone’s expectations,” said Dr. Robbie Melton, associate vice chancellor for eLearning at the Tennessee Board of Regents, Walters State’s governing body. Melton had been scheduled to speak via videoconference, but surprised everyone with a live appearance. Also on hand to mark the occasion were Dr. Lori Campbell, vice president for academic affairs; Dr. Dale Lynch, director of the Hamblen County School System. “This partnership focused on mobilization is the only one of its kind. The leaders of Walters State Community College and the Hamblen County School System work so well together and share knowledge with each other. That is the key to success. We all want to improve education at all levels,” Melton said. “Mobilization will provide education on demand and in your hands,” she added. “The success of this partnership is built on decades of working together, starting with dual enrollment classes being offered as far back as the 1980s and leading up to the location of the Hamblen County International School being on Walters State’s Morristown campus,” said Campbell. “Thank you to Dr. Lynch and the Hamblen County School Board for the support and dedication to this partnership, and to the administrators, teachers and faculty members who have taken up the cause of mobilizing teaching and learning,” Campbell also said. “We have deep gratitude to Walters State -- from Dr. (Wade) McCamey and Dr. Campbell -- to the entire WSCC staff for partnering with Hamblen County Schools in the Technology Mobilization effort. This partnership has allowed our staff and students opportunities that had not existed before this mobilization effort,” said Lynch. McCamey is president of Walters State. Both agreed that much of the credit for the success of the project went to faculty members and classroom teachers, who have embraced technology. The partnership will continue and even grow, as the two systems look for new ways of weaving mobile teaching and learning together. The celebration was held at Walters State’s Morristown campus and included many faculty members, teachers and staff members who have played a role in using mobilization in the classroom. A cake shaped like an iPad was the highlight. The cake’s decorations included many popular Apps that have been used during the project. CUTLINE: Representatives of Walters State Community College, the Hamblen County Board of Education and the Tennessee Board of Regents gathered on Tuesday to celebrate the one-year anniversary of the joint mobilization partnership. 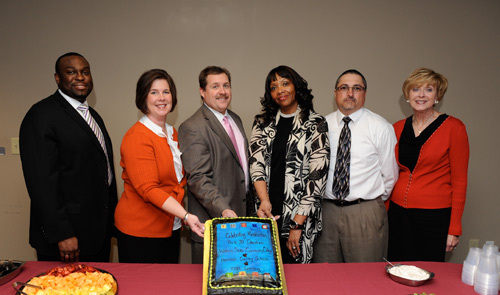 From left are Jeffery W. Norfleet, TBR eLearning Coordinator; Dr. Lori Campbell, vice president for academic affairs at WSCC; Dr. Dale Lynch, director of the Hamblen County School System; Dr. Robbie Melton, associate vice chancellor of TBR eLearning; Dr. Jeff Horner, dean of natural science at WSCC; and Linda Roberts, assistant vice president for academic affairs and dean of distance education. To be able to train students to use technology, teachers need the training first. At Walters State Community College, the instructional design team, a 10-member staff of technology experts who are leading the way to college mobility, offers that training. 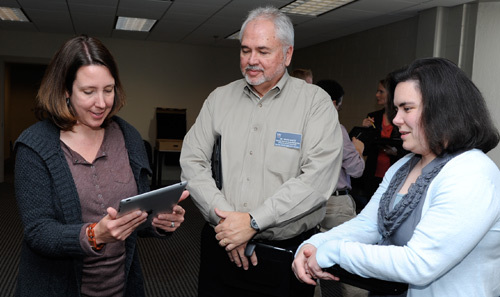 The team held an open house Tuesday and Wednesday to show college staff and educators how to use the latest iPad technologies to engage students in the classroom. “Our big push this fall is mobilization…including the iPad,” said Dr. David White, professor and assistant dean of online instruction at WSCC. “What we find is that 80 percent of our students have a smart phone; it’s connected to the web. We have a lot of instruction that goes on via the web,” White said. Even with so many smart phones among WSCC’s four campuses, in Morristown, New Tazewell, Sevierville and Greeneville, iPads can offer numerous advantages; they are the wave of the future in education instruction, White said. Students can type notes while working on projects, take pictures of strategic steps or even film their work as they do it. They can make digital drawings of sites, use the GPS to record coordinates or even attend class online when their teachers cannot be in classrooms. Tens of thousands of apps are available to download onto iPads on any given day, White explained, and those apps are designed for specific topics and age groups. Thus, not only can students access extra instructional materials, teachers can use apps to give their classes tools to reinforce the same concept in a different way. Teachers can also create editable slideshows and voiceover the pictures or PowerPoint presentations; students might watch the show as part of the class lecture, for an assignment or as supplementary notes. “You get to decide…what format it is. It can be a mp3, which will play on a mobile device, or it can be a Flash, which is what YouTube uses for playing, so everyone can access those two,” White said. This technology, courtesy of Camtasia Studio, offers several savable formats so teachers can ensure their students, both individually and in groups, will be able to access and learn interactively. “We need to teach students about research…students here are learning the practicalities of applying what they learn in the textbook but are actually getting out and working in the field,” said Vivian Gladson, sociology instructor at Walters State. In fact, WSCC teachers can actually submit plans to the college to sponsor and supply iPads for their classes. “The plan has to include, how you can use it; what students you’re going to use it with; what you think the changes will be and how you will test that. Then, you think about how the iPads will engage your students,” White said. Teachers can get iPads already. Approximately 600 have been supplied by the college for faculty, staff and classroom use. The instructional development team has vast expertise in technology, with members including the coordinator of academic instructional technologies and faculty trainer for WSCC, Lou McGuire, as well as the assistant vice president for academic affairs and dean of distance education, Linda Roberts. The team is rounded off with a computer lab technician, Jason Siburt; an information processing specialist, Susie Harrison; and the assistant dean of the R. Jack Fishman Library, Jamie Posey. Also, three associate professors represent different sections of the college: Staci Boruff, nursing; Amy Ross, business; and Allen Nix, computer science. Vickie Mills, secretary in the office of distance education finishes the list. “This committee was chosen to reflect the campus and the academic disciplines of Walters State. Each person brings a unique perspective that will enable the department to anticipate the technology and training needs of the college,” White said. For students, class time means time to turn off cell phones and other mobile devices and put them away. 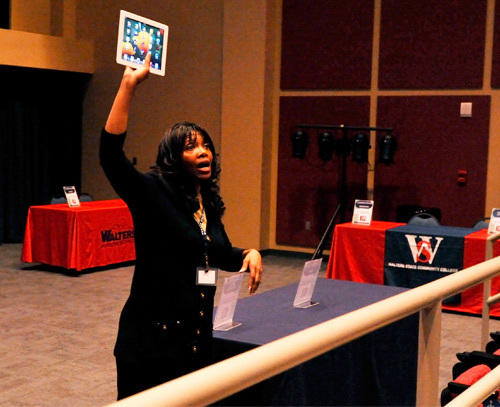 But Wednesday night, Hamblen County students, parents and representatives from Walters State Community College had the opportunity to bring iPhones and iPads to an interactive workshop, and keep them out during the presentation. From Wild West puppet shows to stories being read aloud to drawings on a white board, it all took place on a screen projected from one such mobile device above the heads of the 151 people in attendance. The function of the workshop was two-fold, according to Dr. Lori Campbell, vice president for Academic Affairs for WSCC. The first purpose was to introduce Hamblen County kids and parents to ways to use mobile devices such as iPods and iPads as learning tools, not just toys. In that vein, Dr. Robbie Melton, associate vice chancellor for the Tennessee Board of Regents and Educational Technology, showed students how to read eBooks that are interactive and will read back the name of any object pictured on the page, draw pictures either on a white board or a coloring book and play any imaginable musical instrument – all in free educational applications for iPads and iPhones. The second purpose of the seminar was to announce a partnership between WSCC and the Hamblen County School System to become mobilized. Melton was TBR’s representative to help both entities in that effort. Campbell explained that she was scheduled to spend all day Thursday in a collaborative effort between WSCC and Hamblen County Schools to train teachers and faculty for using mobile devices in the classroom. Campbell also said plans are in the works for a summer mobilization forum on June 20-21. On that college level, Campbell said there are hopes “to engage our students more in learning.” She said they expect to see increased retention and graduation numbers as classrooms integrate mobile devices into the learning process. “It’s all about the students,” she said. Dr. Dale Lynch, director of Hamblen County Schools, agreed that the opportunity for mobilization is a positive one. “It’s just a great partnership that we’ve developed with Walters State Community College, he said, remarking on the significance of getting parents and students to visit a college campus for the presentation. “We’re definitely on the cutting edge of what’s happening,” said Lynch. He anticipates growing swiftly in this new area of education with the provisions from the partnership between TBR, WSCC and Hamblen County Schools. “This is just the start of some great things,” Lynch said. After the keynote portion of the presentation, provided by Melton, a number of interactive displays, all equipped with iPads were available for hands-on learning in science, music, math, special education, games and reading (through iBooks). “I’m glad to see our school system working with the new technology that is available today. I know it will help our children in the future,” said Teresa Templin a satisfied parent of a Hamblen County student. That student, Templin’s daughter Abby, stood next to her, happily absorbed in playing with an iPad. The P-20 Apple Education Mobilization Summit began Monday at Walters State Community College Sevier Count Campus, bringing together some of the nation’s leaders in mobile education technology. 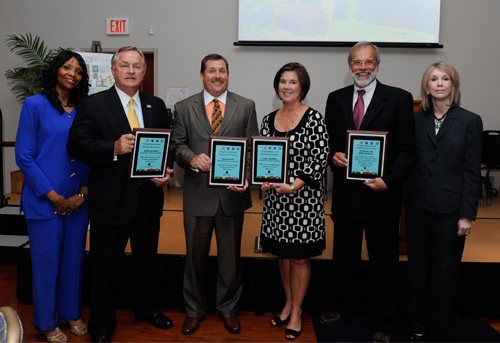 Sponsored by the Tennessee Board of Regents, Walters State and Hamblen County Schools, the summit highlighted the initiative to provide educational learning tools through mobile devices such as cell phones and mobile tablets. “Mobile apps have been integrated into our daily lives. We don’t even think about it anymore. It should be integrated into the education of our students,” Vice Chancellor of Academic Affairs, Tennessee Board of Regents, Paula Short said. Associate Vice Chancellor for eLearning with the Tennessee Board of Regents Robbie Melton said the goal of the summit is to get application software or apps on mobile devices to enhance education. “Less than one percent of students who have mobile devices have educational apps on them. Our goal is to mobilize and work with publishers to put educational devices on these phones and pads,” Melton said. Melton wants Tennessee to be the leader for mobilization education in America. “We want for Tennessee to have a centralized place to get all the apps for classes and subjects. You can go, can use them in the classroom and at home,” Melton said. The Apple iPad is the fastest selling product in history with over two million sold in 59 days of its debut. With the use of education apps, research has shown to turn around the 80/20 rule of education, where 80 percent of the class feels uncomfortable speaking or actively participating in classes, educational apps that allow for comments to be posted turn the rule around to 80 percent participation, a substantial increase. Abilene Christian University in Texas was the first school to establish a comprehensive 1-to-1 mobile learning initiative that supplies every student with an iPhone or iPod Touch. As educators, we should envision the future and that is mobility,” Chief Information and Planning Officer for ACU, Kevin Roberts said. The challenge of the digital age is not accessing information but assessing information. The role of teachers is changing to no longer being the source of information, but more of the assessor of information, according George Saltsman, executive director of the Adams Center for Teaching and Learning at ACU. At ACU, 86 percent of teachers use mobile devices regularly in the classroom. Students have reported learning more with the aid of the devices and improved study habits. “We get questions about the potential for a mobile device to be a distraction. If we didn’t give this to them, they would have used their own, but distractions exist no matter what. The same goes with cheating. There are ways to monitor it, but ultimately it is the students’ choice,” Saltsman said. Saltsman said devices shouldn’t replace interactions in the classroom but instead augment it. Dennis Bega, deputy director of regional operations with the U.S. Department of Education spoke to the crossroads in education that America is facing. “Things cannot stay the way they are if we want them to be the way they should,” Bega said. Bega offered some startling statistics during his speech: 27 percent of American high school students drop out before graduation. In science testing, the U.S. ranks 17th out of 29 developed countries among 15-year-old students. Even worse, in math the U.S. ranks 24th out of 29. “Years ago we claimed it as an act of war to allow other countries to out educate us,” Bega said. Bega said that technology innovations must be made with the student in mind. It is pivotal that educators become comfortable with the technology in order to apply it and educate our children. Bega said the Department of Education is asking for $90 million from the federal government in the upcoming 2012 budget to start initiatives for Advanced Research Projects Agency for Education or ARPA-ED. ARPA-ED allows funding for projects performed by independents and universities based on the potential to create a dramatic breakthrough in research via technology. One grant already in place and available now is the I#, Investing in Innovation grant. The grant is a total of $150 million to support evidence-based practices in education, which individual school districts apply for. “It’s never happened before for the federal government to award a grant to support an idea with an anticipated outcome not yet seen,” Bega said. Dr. Dale Lynch, director of Hamblen County Schools, and dr. Lori Campbell, vice president for academic affairs at Walters State, spoke together of their joint partnership to bring mobilization in their institutions. Both said that access to teachers to learn the technology to teach to students would lead to future success. “In a world where the majority of students have and use smart phones constantly in the classrooms, why not use that towards education them?” Campbell said. Lynch noted that in Hamblen County, 66 percent of the student body is on free and reduced lunch, 878 could not speak English and 689 were homeless. “Technology has helped us bridge the gap of learning and overcoming the challenges of these students’ situations,” Lynch said. Lynch presented a video on how the use of smart tables, which are touch screen video tables, have improved learning in special needs classrooms and expressed he would like to see every pre-k classroom have one. He also discussed the use of podcast and mobile apps like PowerSchool and Ekvideo, which he uses to monitor students in every school in the district. Lynch said currently there are more mobile apps centered for higher education and he called for an improvement and creation of more for k-12 education. In the short future, Lynch and Campbell want teachers to be able to develop their own content for apps. Both have been working with teachers to learn to use the technology to create apps for students. For Walters State, Campbell said teachers have all received mobile devices and this year will be purchasing six classroom sets of iPads (30 for each classroom) and evaluate student performance over the year. If the initial iPads prove successful to student performance, supplying each student could be a potential move in the future. The Board of Regents will launch a website, www.tbrelearning.org, for parents and students to download education apps for mobile devices beginning July 1.